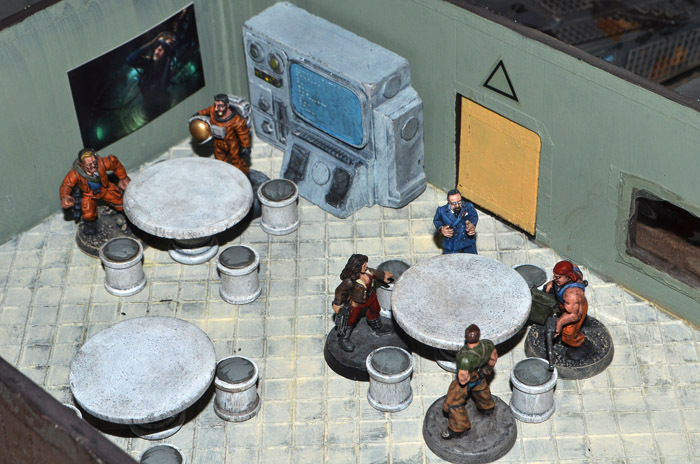 Nate Miller's Tabletop Games: Back from outer space with new easy tables and stools! Back from outer space with new easy tables and stools! Well it's been a while since I posted. Guess I just got burned out on blogging. I've still been playing all this time I just have not been posting much about it. 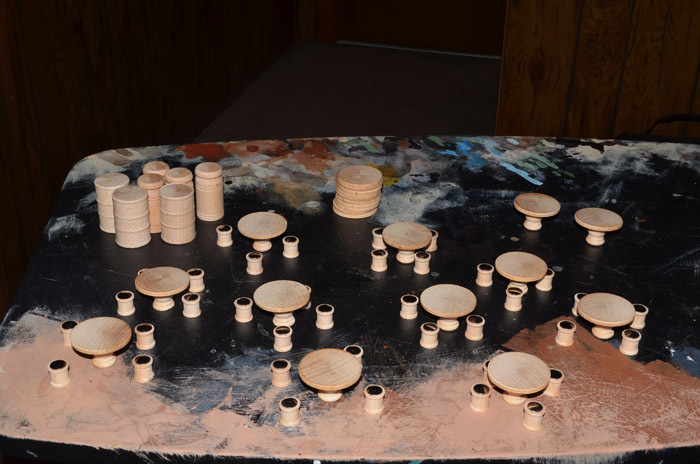 Anyway I found some wood bits at the local Lowles in their hobby section that I thought would make good tables and stools for some of my sci-fi terrain. I got a package of wooden disk with some turned vases and some small spools. I glued the vases upside down on the bottom of the disk to make tables then used thumb tack to make seat cushions for the stools. Assembly took only a little while. I had enough bits for 10 table and stool sets with a couple tables left over. I then primed the tables with primer grey. Here you can see them compared with several random 28mm miniatures. After priming I dry brushed the tables white them painted the cushions and highlighted them. I then added a wash made from burnt umber, dark blue and a bit of floor polish. Although you can see some of the wood grain in the finished product I just chalked this up to the concept that this is cheap mass produced plastic furniture made with a wood grain pattern. One thing I really like about the tables and stools is that you can still get four miniatures around each table with the stools in between which makes them look occupied without having to have sitting models. 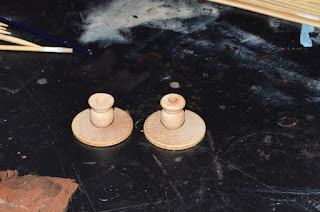 Here is a shot of the bottom of the tables so you can see how easy they were to construct. 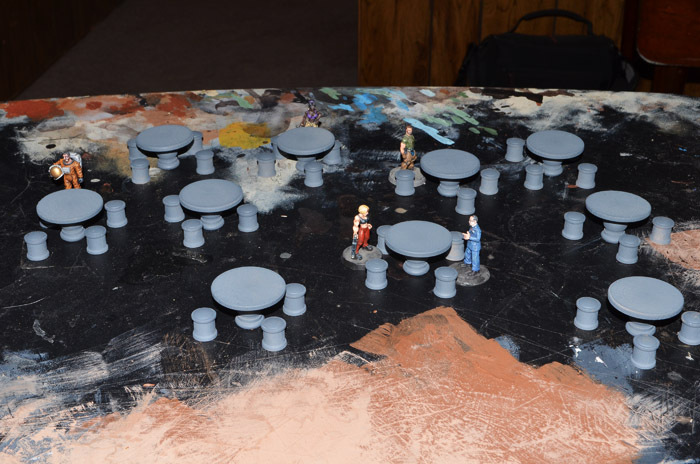 In the future I may make a few tables with things on them for specific terrain sets like a diner or bar. Nice scenery -- and welcome back! Welcome back indeed. Nice writeup on some clever terrain bitz. Great use of the wood bits. I've seen these before and never made the connection. Consider this idea stolen!